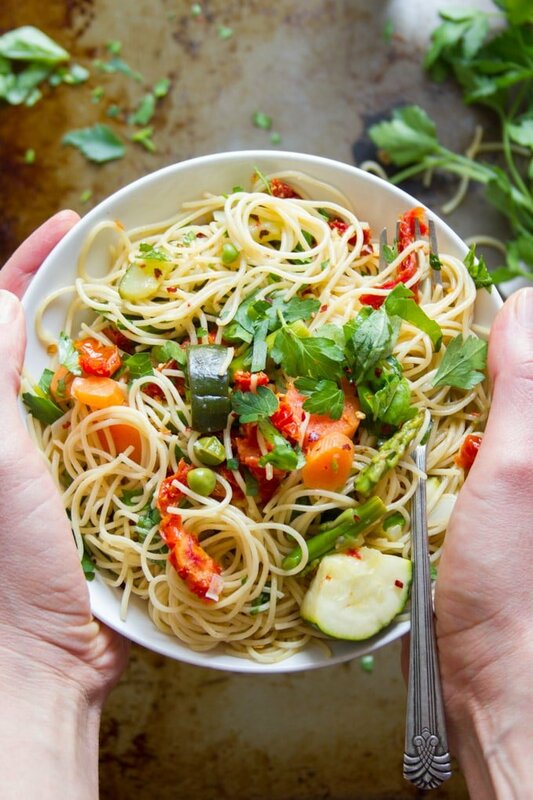 Tender pasta and veggies are drenched in garlicky white wine sauce to make this incredibly flavor-packed vegan pasta Primavera. The best part: it all comes together in 30 minutes. It’s officially March, which means it’s unofficially spring. We’ve got a few weeks to go before the actual equinox, but it’s starting to warm up and there’s actually a little purple flower blooming in my front yard. As you may know if you’re a regular reader around these parts, I’m not one for getting psyched up about the warmer days to come. Give me sweaters and cozy fires. But…you can also give me veggies. And I have to admit that I do get a twinge of excitement when the produce aisle starts getting a little greener this time of year. And hey, it’s still cool enough for sweaters. Sweater weather + spring veggies is the perfect excuse to cook up cozy veggie-packed pasta dishes. 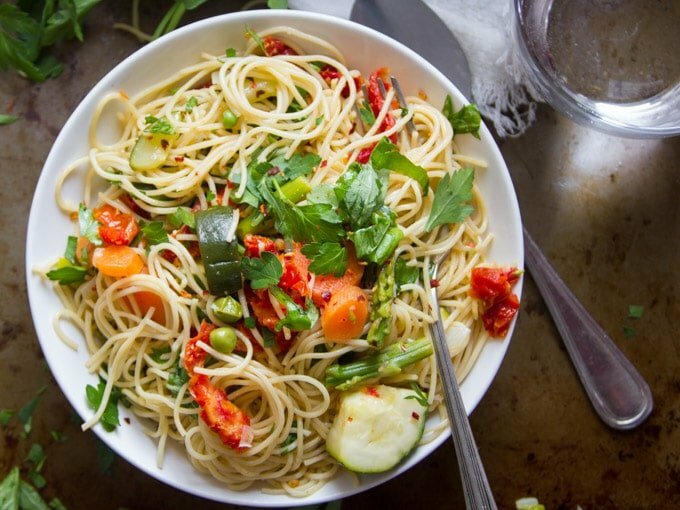 Enter this vegan pasta Primavera. 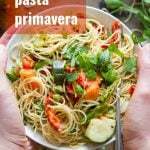 I’ll be frank: pasta Primavera was never a favorite of mine. It can be kind of boring. You know? I can’t be the only one that’s gotten stuck with a bland plate of noodles and mushy veggies as the vegetarian entrée at just about every wedding I’ve ever attended. This pasta Primavera is different. It starts out simple, with some onions, carrots and garlic. Then you add the magic: white wine, a touch of lemon juice, and, get this: light coconut milk! Now the coconut milk doesn’t do what you think. It doesn’t make this a creamy pasta Primavera. It forms a super light and silky smooth coating that makes the noodles absolutely heavenly. And no, I promise the dish doesn’t taste like coconut. While the sauce is simmering you cook the pasta, and add the asparagus to the pasta water just a couple of minutes before it’s done. This allows you to quickly blanch the asparagus without having to use a separate pot! Zucchini and sun-dried tomatoes are simmered in the sauce, and then when the pasta and asparagus are done, you throw them in too, along with some peas. 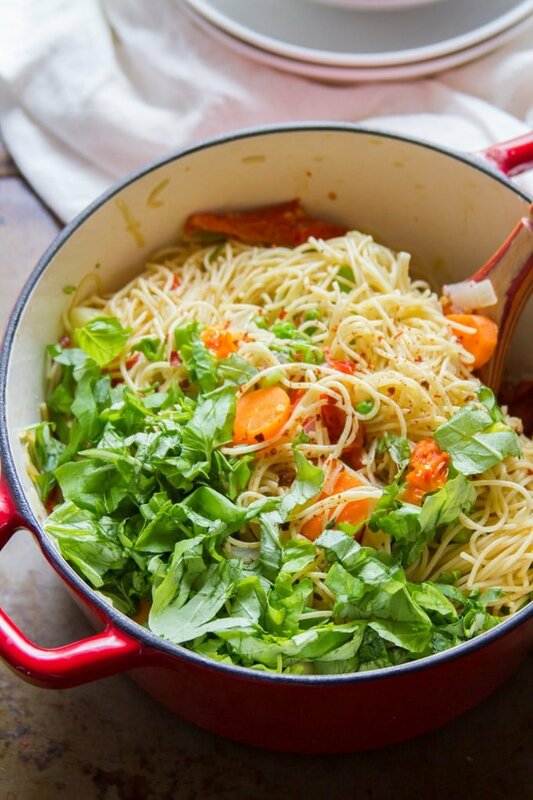 The veggie-packed pasta gets tossed with some basil and parsley at the end. It’ll turn out absolutely delicious and can be on the table in 30 minutes. 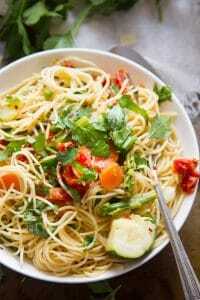 Some tips for making this Vegan Pasta Primavera! Do you hate when you bite into a super tough piece of asparagus because you didn’t trim off enough of the end? ME TOO! To trim an asparagus spear, grab the base in one hand, and grab the stalk in the middle with your other hand. Bend until the end snaps off. It will always break in just the right place. If you are absolutely opposed to coconut milk, you can use another type of non dairy milk like soy or almond. Just make sure it’s unflavored and unsweetened. Feel free to switch things up and use your favorite veggies. Broccoli or cauliflower would be great in place of the asparagus. Summer squash could easily replace the zucchini. And parsnips would stand in for carrots beautifully. This dish comes together relatively quickly, but you can save time by chopping the veggies a day in advance. Since the carrots and onions go in together, store them in the same container. Bring a large pot of salted water to a boil. Add the pasta and cook until al dente according to the package directions. 2 minutes before the pasta is done cooking, add the asparagus. 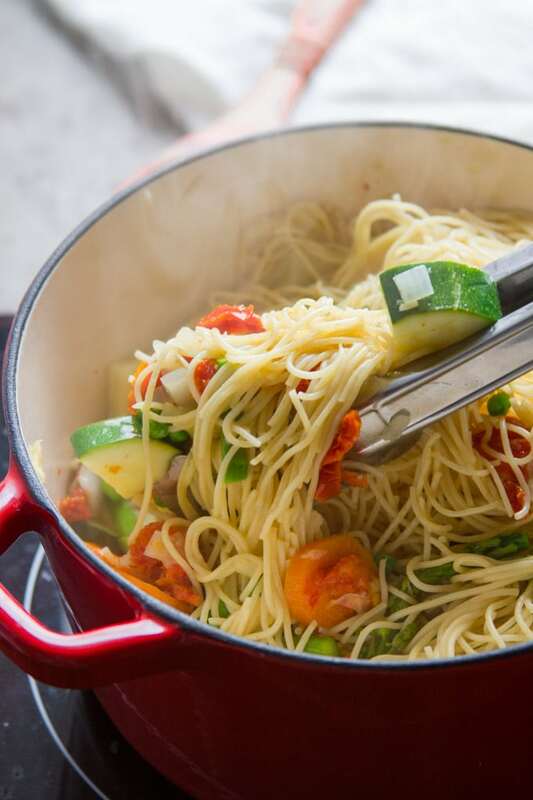 When the pasta and asparagus are done, drain them together into a colander. Return them to the pot and toss with a dash of olive oil. While the pasta cooks, coat the bottom of a large pot with 2 tablespoons of olive oil and place it over medium heat. 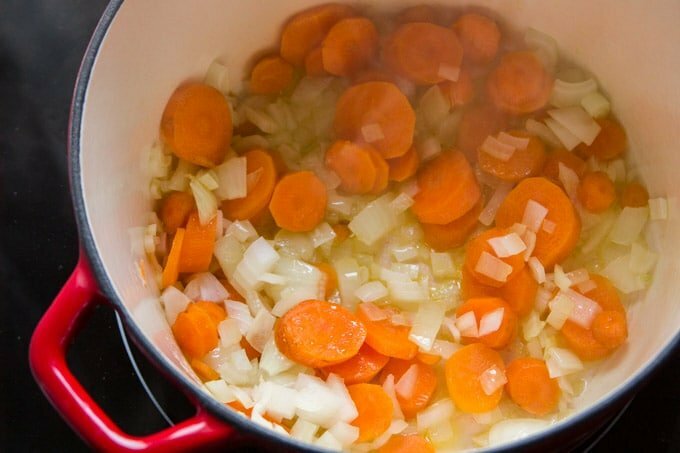 When the oil is hot, add the onion and carrot. Sauté for about 8 minutes, until the carrot begins to soften. Add the garlic and sauté 1 minute more, until very fragrant. Add the wine, coconut milk, lemon juice, zucchini and sun-dried tomatoes. Simmer for about 4 minutes, stirring occasionally, until the zucchini softens and the alcohol has cooked off. Stir in the peas, and then add the pasta and asparagus to the pot. 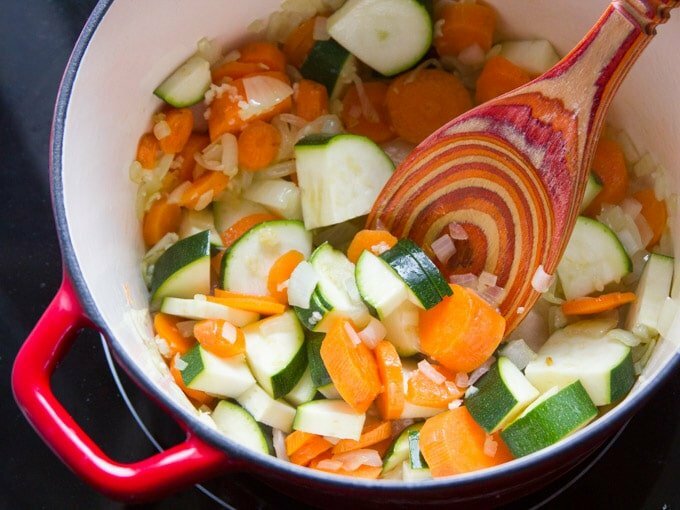 Toss a few times to distribute the veggies, then remove the pot from heat. Stir in the basil and parsley, then season with salt, pepper and red pepper flakes. This Vegan Pasta Primavera sounds absolutely delicious! Love that you can mix and match veggies to fit your personal taste, not to mention how quickly it all comes together – YAY! Definitely need to try this yummy dish! Thanks so much Ameera!! I hope you enjoy it! Well I’m happy you found it too!! I hope you enjoy the recipes! Thanks Ashleigh! I just got done enjoying this with my mom and brother. We loved it! I especially liked how easy it was and healthy. What great flavors! Yay!! Glad you enjoyed it!! Just want to say thank you for all these incredible recipes. 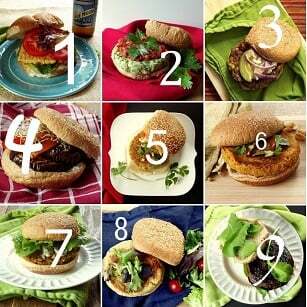 I’m not vegan myself, but certainly have been eating far more vegan dishes since a friend sent a link to this site. Can’t wait to try this one. I’m so glad you’re enjoying the recipes! I hope you like this one as well! Thanks Marie! Just made this for dinner with my boyfriend and we absolutely loved it! First shot at a pasta primavera since we both went vegan over a year ago. Not sure how we waited this long. Super delicious. Coconut milk was a great idea. Thank you! Awesome!! I’m so glad you both enjoyed it! Thanks Miranda! This turned out so well. I loved it and so did my non vegan husband who added a little Parmesan. I was thoroughly pleased how well the sauce turned out and you were so right about the non coconut taste. My husband had no idea! Awesome!! I’m so glad you both enjoyed it! Is that fresh or canned coconut milk? Cant wait to try it. I used canned, but I think fresh would work too – I’ve just never had access to it! I absolutely loved it. I didn’t have any white wine on hand as I don’t drink…but it still turned out really tasty. I’ll be making this over and over. Thank-you!